Somebody has a great idea. Some boring person points out that perhaps we’re overdoing it a bit and things are bound to go pear-shaped eventually. With fossil fuels and resulting climate change, we’re currently at 4. While you’d be mad to think that the carbon tax is going to solve the problem by itself, with any luck it might be a start to mitigating the disaster our children and grandchildren are going to have to deal with down the track. So quit whingeing about a few extra dollars on your electricity bill and put a bloody jumper on instead. The place will warm up eventually. 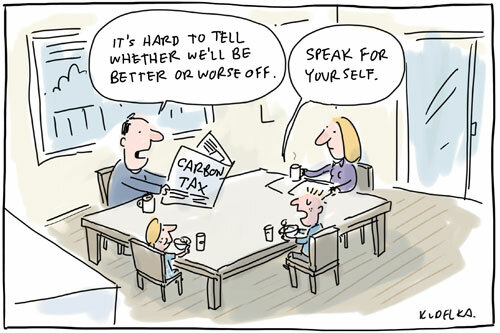 Posted in political cartoons, The Mercury and tagged carbon tax, kids, worse off, better off. Actually Christine Milne is morphing into me. Somebody should take a photo.